New IAC Merchandise Web Store is Here! 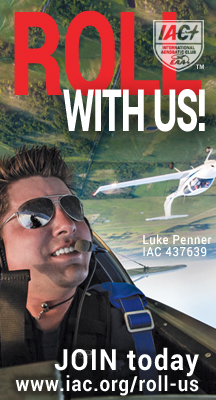 Introducing the new IAC Premium Collection Aerobatic Merchandise web store! Items are available in four categories: Men's, Women's, Youth and Accessories. Check out the new item additions. And yes, the iconic IAC items will always be available! Here is the store link: www.iac.org/store. You can browse the store at any time to give it a "fly over" view. At a Special Teleconference Meeting of the IAC Board of directors held today, Ron Schreck IAC #433751 was chosen, by unanimous affirmation by the Board of Directors, as the Contest Director for the 2019 U.S. Nationals to be held in Salina, Kansas, 21-27 September 2019. A formal Nationals Site Review Process was ordered by the IAC Board of Directors at the annual Fall Board meeting in November of 2018 and Bob Freeman was tasked with conducting the process. Bob’s team consisted of Lorrie Penner, IAC Executive Director, IAC Secretary Lynn Bowes, former Director and founding member of Wichita Chapter 119 A.J. Hefel, and Kansas City Chapter 15 members John Morrissey and Linda Meyers-Morrissey. Everyone volunteers at contests and enjoys the social opportunities of making friends and working on a team. It’s clear that team-building is a large part of the IAC culture on more than just the Unlimited and Advanced Aerobatic Teams that represent the United States at world events. Now is your chance to contribute and join a team on a larger scale! The 2018 winner of the L. Paul Soucy Trophy is Larry Ernewein of Innerkip, Ontario, Canada. Larry is the first Canadian to win the award as well as being one of the oldest, at 67.